Sharma, R., Firdaus, H., Maheshwari, V., Akhtar, K., Siddiqui, S. (2012). Chemotherapy and Management of Locally Advanced Carcinoma Cervix. Iranian Journal of Pathology, 7(4), 224-230. Rajyashri Sharma; Huma Firdaus; Veena Maheshwari; Kafil Akhtar; Shahid Ali Siddiqui. "Chemotherapy and Management of Locally Advanced Carcinoma Cervix". 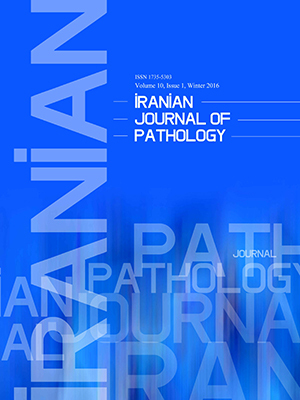 Iranian Journal of Pathology, 7, 4, 2012, 224-230. Sharma, R., Firdaus, H., Maheshwari, V., Akhtar, K., Siddiqui, S. (2012). 'Chemotherapy and Management of Locally Advanced Carcinoma Cervix', Iranian Journal of Pathology, 7(4), pp. 224-230. Sharma, R., Firdaus, H., Maheshwari, V., Akhtar, K., Siddiqui, S. Chemotherapy and Management of Locally Advanced Carcinoma Cervix. Iranian Journal of Pathology, 2012; 7(4): 224-230. Background & Objective:the present study was undertaken to ascertain the incidence of early, advanced cancer cervix and its recurrence and role of chemotherapy in locally advanced cancer cervix. Material and Methods: The present study was conducted in the Departments of Obstetrics & Gynaecology, Pathology and Radiotherapy and the specimens examined in the Department of Pathology of Jawaharlal Nehru Medical College, Aligarh Muslim University, Aligarh, India from July 2009 to July 2010.One hundred histologically confirmed carcinoma cervix cases were divided into two groups. I: Study group of cases receiving different types of chemotherapy and II: Control group comprised of cases on pre and postoperative radiotherapy and surgery. Patients were staged and locally advanced inoperable cases (Stage IB-IVA) were given different types of chemotherapy. Thereafter subjective and objective assessment was made according to World Health Organization (WHO) criteria of tumor response. Results: Majority of cases (60.0%) presented in stage IIB of disease by International Federation of Gynecology and Obstetrics (FIGO) classification. Commonest symptom was postmenopausal vaginal bleeding, 70.0% cases. 68.0% & 56.0% cases showed complete response (CR) on chemotherapy and radiotherapy respectively. Stage IIB patients showed the best response with CR in 70.0% & partial response (PR) in 16.7% cases. Colposcopic evaluation on 12 -18 months follow up showed 08 to be disease free, with decrease in size of tumor. Conclusion: Chemotherapy is an effective mode of therapy and can be considered as an adjunct to surgery or radiotherapy to improve the overall survival of cancer cervix patients. National Comprehensive Cancer Network. NCCN Clinical Practice Guidelines in Oncology: Cervical Cancer v.1.2009. Available at http: //www.nccn.org/professionals/physician_gls/PDF/cervical.pdf. Accessed August 25, 2009. Solomon D, Breen N, McNeel T. Cervical cancer screening rates in the United States and the potential impact of implementation of screening guidelines. CA Cancer J Clin 2007;57 (2):105-11. Smith RA, Cokkinides V, Brawley OW. Cancer screening in the United States, 2009: a review of current American Cancer Society guidelines and issues in cancer screening. CA Cancer J Clin2009;59(1):27-41. Markman M. Presentation of chemotherapy options for cervix cancer on cancer-related Internet sites. J Womens Health (Larchmt) 2009;18(6):827-9. Kumar JV, Doval DC, Rao R, Rawal S. A retrospective study of patients with locally advanced cancer of the cervix treated with neoadjuvant chemotherapy followed by radical surgery. Int J Gynecol Cancer 2009;19(3):417-22. Zhao FH, Lin MJ, Chen F, Zhang R, Belinson JL, Sellors JW, et al.. Primary screening for cervical cancer: a pooled analysis of individual patient data from 17 population-based studies from China. Lancet Oncol 2010;11(12):1160-71. Gonzalez DA, Zarba JJ, Patel F, Alcedo JC, Beslija S, Casanova L, et al.. Phase III, Open-Label, Randomized Study Comparing Concurrent Gemcitabine Plus Cisplatin and Radiation Followed by Adjuvant Gemcitabine and Cisplatin Versus Concurrent Cisplatin and Radiation in Patients With Stage IIB to IVA Carcinoma of the Cervix. J Clin Oncol2011;29(13):1678-85. World Health Organization. WHO/ICO Information Centre on Human Papilloma Virus (HPV) and Cervical Cancer. Available at http://www.who.int/hpvcentre/statistics/en/.. Accessed April 2, 2011. Duenas-Gonzalez A, Lopez-Graniel C, Rivera L, Guadarrama R, Chanona G, De La Garza J. Clinicopathological Variables Predictive of Clinical Outcome in Patients with Cervical Cancer Treated with Cisplatin-based Neoadjuvant Chemotherapy Followed by Radical Hysterectomy. Anticancer Res 2010;1:201-8. Panici PB, Stefano G, Alessandro C, Mariangela A. Pattern of Failures and Clinical Outcome of Patients with Locally Advanced Cervical Cancer Treated with a Tailored Integrated Therapeutic Approach. Anticancer Res 2010;1:3731-5. Panici PB, Stefano G, Alessandro C, Mariangela A, Costantino M, Fabio L. Neoadjuvant Chemotherapy and Radical Surgery Versus Exclusive Radiotherapy in Locally Advanced Squamous Cell Cervical Cancer: Results From the Italian Multicenter Randomized Study. J Clin Oncol 2002;20(1):179-88.